(CNN) -- Ravi Bopara laid down his case for Ashes selection with a second successive Test hundred against the West Indies at Lord's on Wednesday. 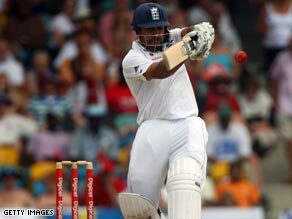 Bopara scored his second successive century to rescue England on the opening day at Lord's. Bopara, 24, began the summer with an unbeaten 118 which held England together after a post-lunch collapse in the first Test, and allowed them to close the opening day on 289 for seven. His opportunity at number three, ahead of rivals Michael Vaughan and Ian Bell, came after he hit a century as a fill-in for the Barbados Test two months ago. Omitted for the final match of that series in England's bid to dismiss their hosts twice, he made the most of his recall and West Indies' flaws in the field to put his name in the frame to face the Australians in the summer's box office event. Twice he was dropped during the final session -- while sixth-wicket partner Stuart Broad was put down on four occasions -- as England were given a huge let-off in their quest to regain the Wisden Trophy. Bopara celebrated his second Test hundred 13 overs from the close when he nudged a single into the leg-side, while Broad's luck eventually ran out when he sliced a ball to backward point off giant spinner Sulieman Benn. Tim Bresnan, one of England's two debutants, was then harshly adjudged leg before to a Benn delivery angling in, on the eve of stumps. Bopara's century rescued England, after a fiery post-lunch spell from Fidel Edwards accounted for three wickets in a six-over period. Firstly, Alastair Cook's lack of footwork resulted in him re-directing the ball back onto his own stumps while Kevin Pietersen, in his first innings in this country since his high-profile demise as captain in the new year, was spectacularly dismissed first ball when a full delivery left him in the air and flew off the outside edge through to wicket-keeper Denesh Ramdin. More outswing from Edwards was rewarded with a third afternoon success when Paul Collingwood edged low to Devon Smith at second slip. Bopara arrived at the crease when captain Andrew Strauss, who scored more than 500 runs in the away series defeat to West Indies, perished in the seventh over of the innings when swishing at a Jerome Taylor delivery outside off-stump. He did not operate in his usual carefree manner, however, and was happy to play second fiddle to Matt Prior during a stand of 84 for the fifth wicket. Having hit eight boundaries in 42, which sent him through the 1000-run barrier in Tests, Prior slapped his first ball after tea straight to cover to provide Edwards with a fourth success.